This is JYP's new boys' group - 2PM. Their teaser (M/V) as above, is called "10 out of 10". It is a catchy dance song. It is pretty funny that JYP has published a group named '2AM' and now he announces 2PM. I hope they don't compete each other like 2PM vs. 2AM. 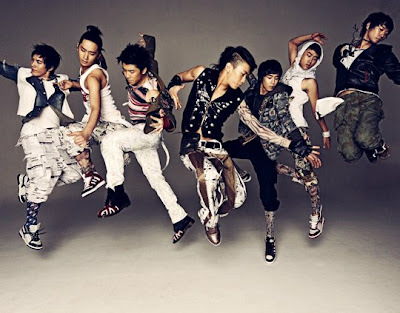 JYP said that if 2AM is about balld and slow songs, 2PM is about dance and rap. I think the group names make sense, at 2PM, people can excite and enjoy dance songs and 2AM, they can listen to slow songs to go to bed or meditate. Interestingly, Nichkhun Horvejkul is Thai. He was born in America and moved to Thailand at the age of 2. I saw him on Ya Shim Man Man Season 2 on SBS, and his Korean was not that good, but I saw that he is trying hard. I hope good luck to him. Their debut date is September 4th. Marie February 5, 2009 at 7:11 a.m. Anonymous November 30, 2009 at 10:14 p.m. Anonymous August 12, 2010 at 2:34 p.m.
Nice post and this fill someone in on helped me alot in my college assignement. Thank you for your information. Anonymous May 22, 2013 at 6:15 p.m. Thank you, I've just been looking for information about this subject for a long time and yours is the best I've found out so far.